The idea for flower clips came to me while I was making a Christmas gift for my 9 year old niece. I had just finished a hat and scarf set for her and wanted to make something with the leftover yarn. 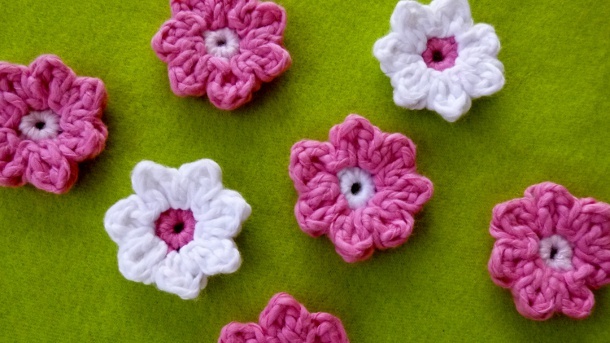 These adorable Flower Clips will brighten any little girl’s day. They are easy and quick to make, less than a half hour each. And the clips make great gifts; attach a couple on a birthday card or add a couple to your little cutie’s Easter Basket. The flowers are so cute and can be sewn on just about anything. 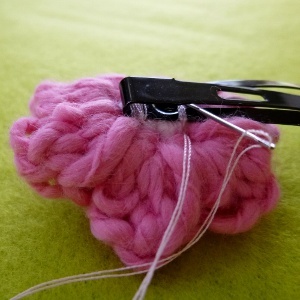 Embellish a hat, scarf, hairband, pillowcase or baby blanket. The possibilities are endless. Enjoy! Gauge: Gauge is not measured for this pattern. Note: See Fall 2012 Crochetvolution for picture tutorial of magic ring. With Color A and I hook, make magic circle/adjustable ring. Ch 1 then work 7 sc into ring. Join with a sl st. Tighten and break off yarn. 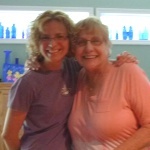 Attach color B at any stitch, ch 1 and in same stitch, hdc, dc, hdc, sl st. Work Petal in each of the next 6 stitches. Break off yarn. Work in ends. 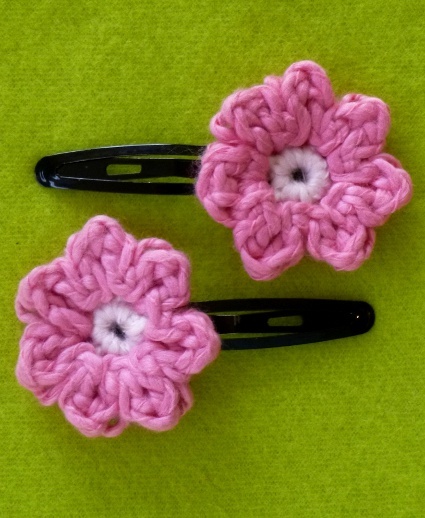 Sew flower to hair clip with matching or invisible thread. Make sure it is securely attached.